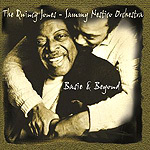 CD review: "Basie & Beyond"
This review first appeared in the November 26, 2000 edition of the American Reporter. While Duke Ellington's centenary birthday celebration has stretched on for more than two years now, the late Count Basie's musical influence left an equally indelible mark on American popular music. Heresy, perhaps, to "serious" jazz scholars who see in Ellington an intellectual figure to place jazz alongside classical music in the arts pantheon. But Basie's band always swung harder than Ellington's, and was, in its early days, a pure dance band whose propulsive rhythms made Basie's band the No. 1 dance band in the country, this during Jim Crow when the band couldn't even play in dozens of cities. And consider this: The postwar jump blues of band leaders like Louis Jordan came right out of the Kansas City tradition of Basie and Jay McShann, and it was that jump blues that led directly to rock 'n' roll and rhythm and blues. None of which can or should take away from what Ellington accomplished. But too often Ellington is lauded to the exclusion of others  folks like Basie. So leave it to another legendary figure in American popular music, Quincy Jones, to bring some of that spotlight back to his old mentor and friend. A new tribute to Basie with longtime Basie arranger-composer Sammy Nestico has all that spirit and sense of fun one associates with a Basie project. Not this is a Basie album; for that, we still have his band, led by and staffed with his former sideman continuing his legacy in a way he would be comfortable with. This is a tribute from men who worked with him, learned from him, loved him. Nor are the songs here necessarily "Basie" songs. Instead, they are songs written by Jones and Nestico, both of whom wrote and arranged for Basie (Jones in the early '60s, Nestico through the late '70s and early '80s), and done up in the signature style of Basie's bands. So we get some of the sweetest ensemble playing, lots of bigger-than-life solos, and both laid down atop the swingingest groove you'll ever hear. While Basie was known for having flashy stars in his band, the only "name" players here are Kirk Whalum on saxophone and Hubert Laws on flute. If the others are unknown, they all take their solos with strutting style and panache. Finally, everything is done with a smile. And that was probably Basie's greatest legacy  that if you're playing music, you ought to be having fun.